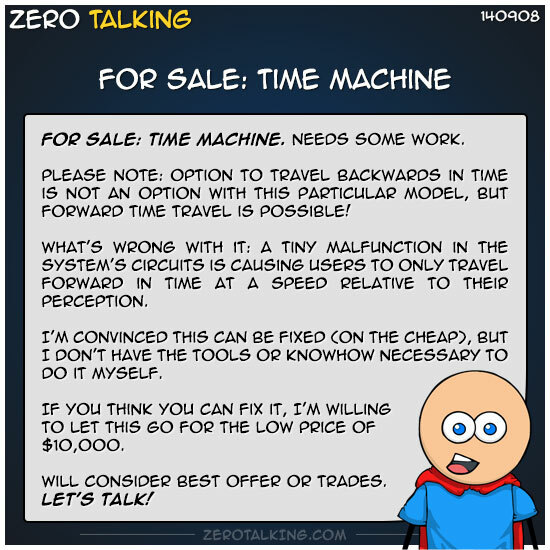 Please note, option to travel backwards in time is not an option with this particular model, but forward time travel is possible! What’s wrong with it: A tiny malfunction in the system’s circuits is causing users to only travel forward in time at a speed relative to their perception. I’m convinced this can be fixed (on the cheap), but I don’t have the tools or knowhow necessary to do it myself. If you think you can fix it, I’m willing to let this go for the low price of $10,000. Will consider best offer or trades. Let’s talk! Dave: I time travel for free now. I fall into a deep, horizontally situated pseudo coma and when I come out, I’m some 6-8 hours into the future. Zero: Any way you can let me know how you do that? Free, you say?